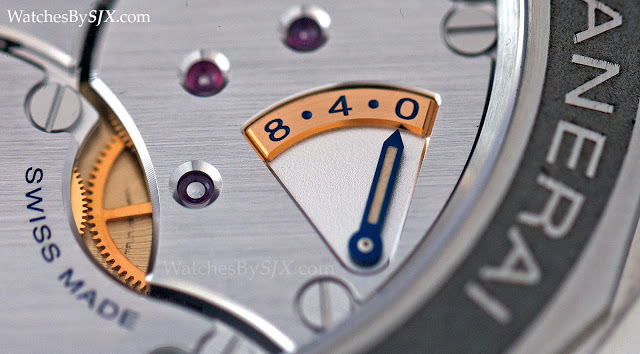 A departure from the typical Panerai formula, the Equation of Time 8 Days features an uncommon complication, with a linear scale indicating the difference between mean time and solar time. 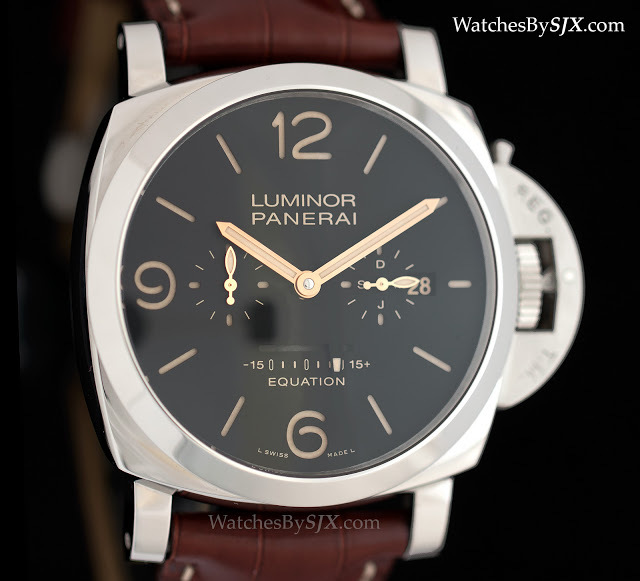 Introduced at SIHH 2015, the Equation of Time 8 Days is an unusual Panerai. Instead of a complication typical for the brand like a chronograph or second time zone, the Equation of Time 8 Days – available either as a Radiomir 1940 (PAM516) or Luminor 1950 (PAM601) – shows the difference between mean solar time and apparent solar time. That’s the difference between the conventional 24-hour day and the actual length of the day based on the Earth’s orbit of the Sun, what you would see on a sundial in other words. Though best known as the maker of military-inspired sports watches, Panerai has made timepieces with astronomical displays as tributes to Galileo Galilei, the astronomer who was born in Florence, the hometown of Panerai. One is the impressive Jupiterium clock that displays the planets of the solar system, and the other is the L’Astronomo Luminor 1950 Equation of Time, the most complicated Panerai wristwatch ever. 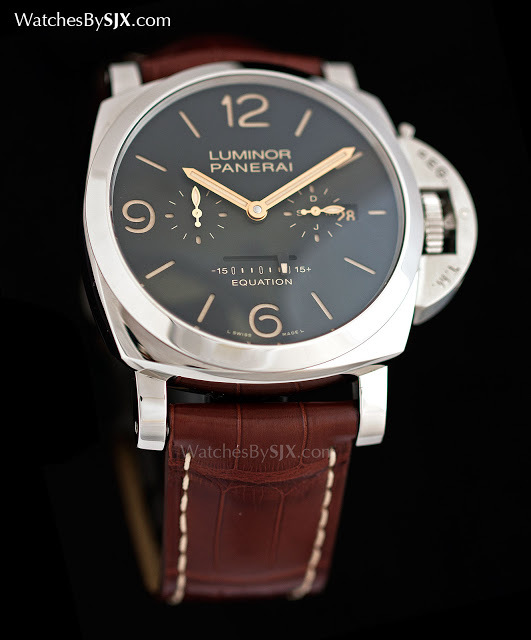 Both Radiomir 1940 and Luminor 1950 versions of the new Equation of Time 8 Days are powered by the calibre P.2002/E. This movement features the same equation of time function as the L’Astronomo, which was 50mm in diameter and cost over US$200,000. Fortunately the new Equation of Time 8 Days, available either as a Radiomir 1940 or Luminor 1950, is more manageable, both physically and financially. The world works on the standard 24-hour day that’s shown on watches and clocks, known as mean solar time. But because the Earth travels around the Sun in an ellipse rather than a circle, time based on the Earth’s orbit, known as apparent solar time, is not the same. The difference between the two is the equation of time. Equivalent to the difference between a watch on the wrist and a sundial, the equation of time is zero only four times a year. The rest of the year, apparent solar time can be ahead by as much as about 16 minutes, or behind by just over 14 minutes. This is displayed on the linear scale at six o’clock, calibrated from -15 minutes to +15 minutes. 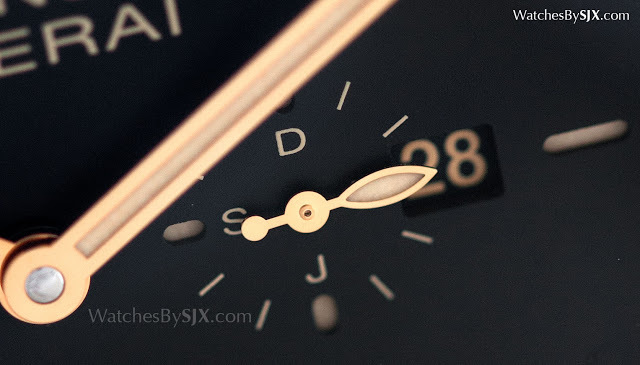 Months are indicated in the sub-dial at three o’clock, with “D” representing December and “J” for January. The date is also at three o’clock, while the sub-dial at nine is for the constant seconds. The P.2002/E is hand-wound, with an eight day power reserve. 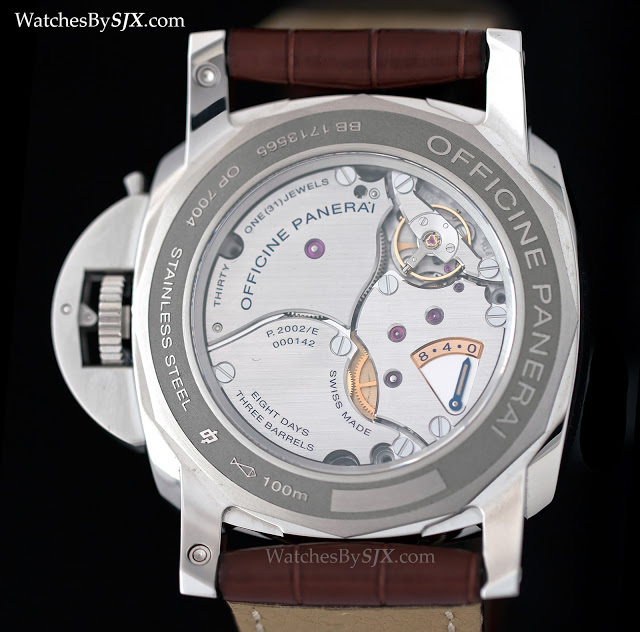 Like several of Panerai’s other watches, the power reserve is shown on the rear of the watch. 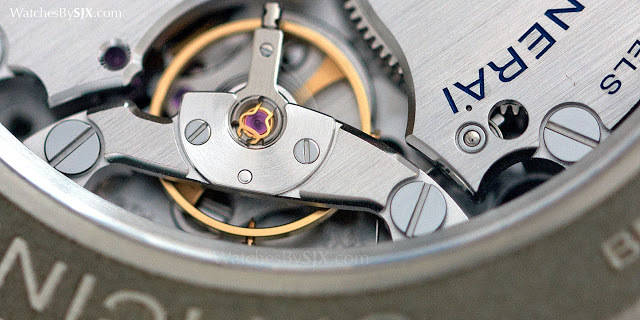 The power reserve is integrated onto one of the barrel bridges, as on the P.3001 movement inside Luminor 1950 PAM422. 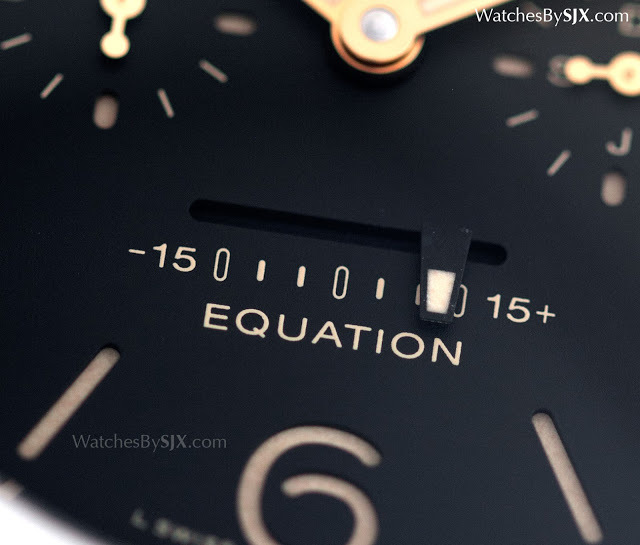 The Equation of Time 8 Days is available in two guises. 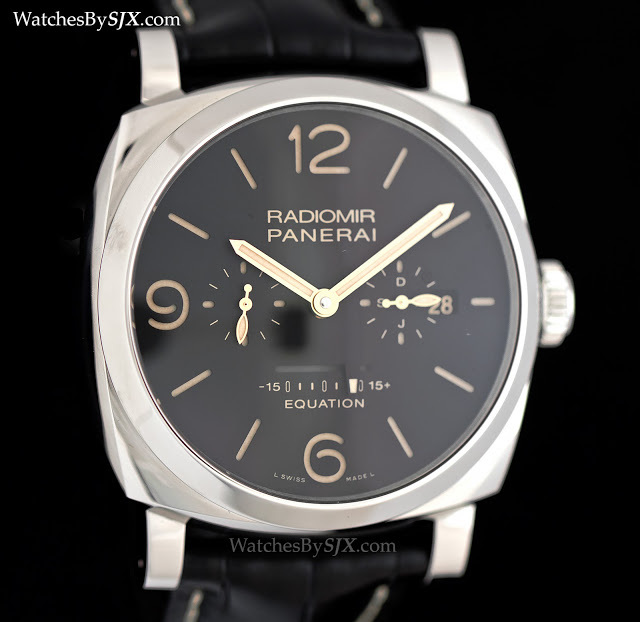 The first is the Radiomir 1940 (PAM516), limited to 200 pieces, with a 48mm steel case. This costs US$21,500 or S$29,100. The second is the Luminor 1950 Equation of Time 8 Days Acciaio (PAM601), a 100-piece limited edition that’s also steel and 47mm. This is priced at US$22,000 or S$29,800. 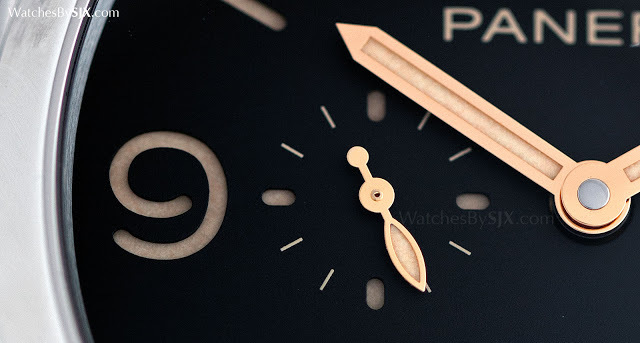 While pricey by the standards of an average Panerai, the Equation of Time 8 Days is overly expensive compared to similar complications from other brands, which usually pair it with a perpetual calendar. 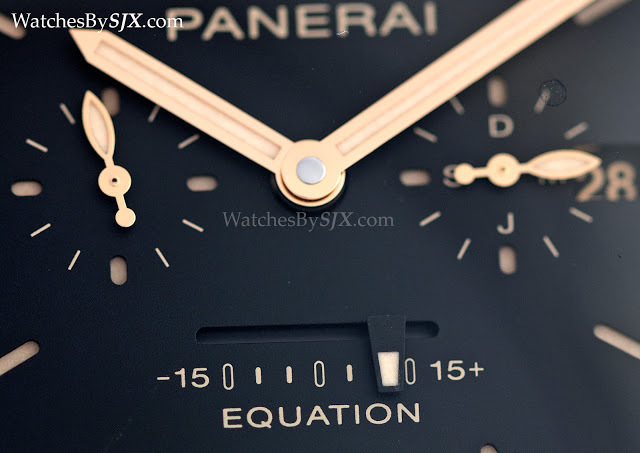 Though the equation of time is not a function typical of Panerai, it is an intriguing and uncommon feature that adds a mechanical interest to a watch that appeals primarily for its aesthetic.